Welcome back to the Intelligent Investor series. 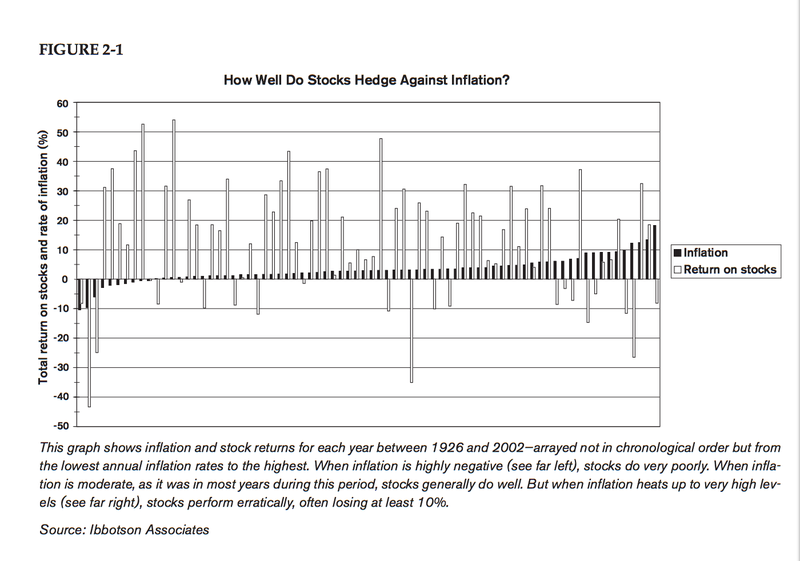 This post reveals Graham’s stance on inflation and what the Intelligent Investor can do to maintain consistent results that protect their buying power. The preceding posts on the Introduction and Chapter 1 can be found here. The chapter begins by explaining how inflation needs to be in your considerations of not just your end investment successes , but in choosing an investment vehicle that performs best in a given inflationary circumstance. He makes note that, once again, the investor is able to make use of past data to position his assets in a way that will compliment inflation. The investor should then position his holdings to be adjusted for some level of uncertainty that stocks would underperform bonds rather than an all-stock strategy. Eventually, Graham goes on further to describe that the markets have also shown that investing in “things” as a hedge against inflation has not turned out to be a prosperous venture in the past. He suggests: rather than buying into physical things , the investor is again speculating on the future price and value of the object. Zweig notes here that an investor under the age of 65 would actually do well to have about 2% of their financial assets in a fundexposed to precious-metals, rather than buying the metals outright. The point he remarks here is that the 2% holdings is too small to affect your returns if it does poorly, but can help offset losses due to inflation. The more the investor depends on his portfolio and the income therefrom, the more necessary it is for him to guard against the unexpected and the disconcerting in this part of his life. Zweig’s commentary on this chapter was concise and relevant. He reiterates the importance for the investor to understand his investing success in terms of how much you keep after inflation. One should recognize how this concept relates so centrally to Graham’s philosophy of protecting your principle. I got interested in checking out inflation against my after-tax results and was surprised at how neatly the data is presented on current and past inflation here, but I so rarely hear other investors talking about their gains compared to rates of inflation. Zweig also goes on to mention how the investor now can help hedge against inflation as he can invest in REITs (Real Estate Investment Trusts)and TIPs (Treasury Inflation-Protected Securities). The Intelligent Investor, now armed with a knowledge of inflation’s affects on equity and debt markets can make a wiser asset-allocation decision in the context of his current financial goals and subsequent acceptable risk levels. Recommend the article if you found value in it and would like to follow along. I just recently purchased this book, and will be reading along with you! Awesome! Please feel free to contribute your thoughts. If you really like something, don’t be afraid to share it out so we can get more opinions on each chapter!